Apparently, the sago is a male because it has grown a cone shape flower. The gardener cut it off. 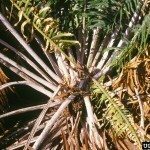 The problem now is that the palm has not started growing new foliage. It has been like this for over 6 months. What do I do to fix this problem? On my sago palm that golden crown on the top is the new growth. It will seperate into soft feathery fronds that get larger and darker green. They also get stiffer and more pricky as they mature.